Stuck in airport security? Your flight get delayed? Looking for a fun way to pass the time? Here’s 20 fun questions and trivia to spark new conversations to make new memories and have the time fly by in the airport and on the plane! Have a blast with these! The view from our flight from Denver, CO to Seattle, WA! Amazing! 1. Choose pretzels or peanuts on your flight? 2. Have the aisle, window, or middle seat? 3. Have a baby wailing next to you or the kid behind you kicking your seat for the whole flight? 4. Have the most turbulent ride you’ve ever had but get to your destination early, or have a smooth ride and be five hours late? 5. Be a pilot or air traffic controller? 6. Find yourself sitting in first class next to someone famous, who would you want it to be? 7. Win an airplane ticket to anywhere in the world to take today, where would you want the destination to be? 8. Do the safety announcement, how would you make it more entertaining? 9. Order anything on the menu, what would be your first three choices? 10. Fly over any part of the world on your flight, where would you want to fly over to see it from above? 11. Your most embarrassing moment on a flight. 12. The most interesting conversation you’ve ever had on a flight or you’ve overheard on a flight. 13. Your top three pet peeves of what other passengers do on a plane. 14. Your most memorable flight. 15. The craziest delay you’ve had for a flight. 16. In what country did the first commercial flight take place? Answer: USA from St. Petersburg, Florida to Tampa, Florida in 1914 covering over 18 miles in 23 minutes. 17. In what country did duty free shops start? 18. What country boasts the busiest airport in the world? Answer: USA, with Hartsfield- Jackson Atlanta International Airport in Atlanta, Georgia. 19. How much did the first airline ticket cost? St. Petersburg, Florida to Tampa, Florida. 20. How many hours is the world’s longest commercial flight? Answer: 18.5 hours from Singapore to New York. The next longest flight is 17.5 hours from Auckland, New Zealand to Doha, Qatar. 2. And, download these conversation starters so you can easily pull them up later! Woop Woop! Here’s your list of 20 Fun Questions for the Airport and on the Plane for your next trip! Have a blast with these! 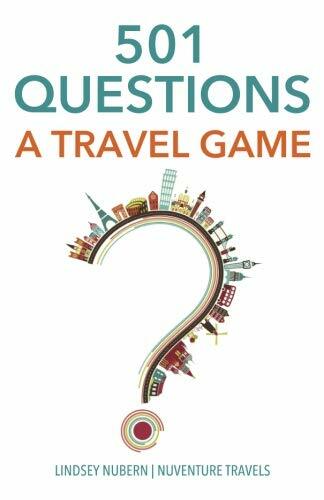 Get 501 more awesome conversation starters in our new game 501 Questions: A Travel Game! Have a blast with these on all of your adventures!